I learned a lot of things during my time in Chicagoland, like how to drive in, and shovel, snow, how everyone should hate the Packers, and how you are not sposed to put ketchup on a hot dog. But this week I’ve decided to use something I learned from Illinois’ politics. That’s right, good ol’ Rod Blagojevich taught me something before he ultimately fell on his face. The difference between the former Illinois governor, who got busted for trying to sell Barack Obama’s vacant Senate seat, and me is that what I’m doing isn’t illegal. At least I’m pretty sure it isn’t. 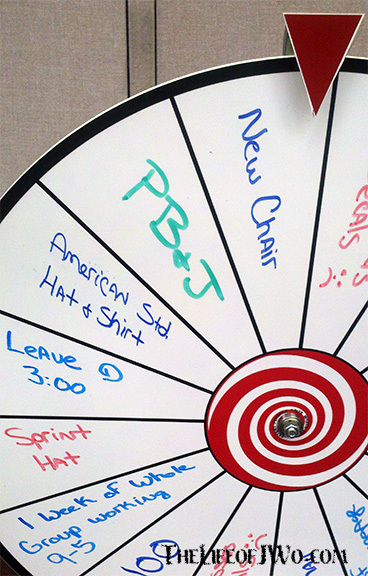 A few weeks ago I won a new chair from the “prize wheel” that we spin at work about once a month. While I was excited that I would be getting a new chair, the winning moment came about three weeks too late. Even though I have only been at work since the end of February, I have already been through THREE chairs, and NO, I didn’t break them. The first chair was old and uncomfortable, so I swapped it for the second chair. It worked fine for a couple of months but then one day it developed what I called the Gangsta Lean and permanently tilted to the right when I sat. The way the chair sat made it perfect for driving an old hoopty car, but wasn’t very comfortable for sitting at a computer all day. I swapped that chair in for one with the hydraulics blown out so bad that the bottom drug on the ground, even though it had wheels . It was so bad that I had to put a rag under it in order to move it over the carpet mat at my desk. I had that chair for a couple of weeks when my Mom said she would be getting herself a new chair for her office and that I was welcome to her old one. She brought it up with her when she visited at the first of June and I have been using her chair ever since. Well, until this week when my new chair arrived. I carefully assembled the chair and liked some of the features, but there was one thing I didn’t like. The back wasn’t high enough. I picked up a bad habit from my old newspaper days of leaning really far back and resting my head on the back of the chair. I couldn’t do that with this one and I found myself missing my old chair. Of course my seat isn’t nearly as important as a vacant Senate seat, but I’m still hoping I can get a fair price for it. By fair I mean I might be able to make $8 for it. I’m only charging $1 per entry for the seat and as of now I only have two entries, but I’m hoping that will change as Friday’s 4 p.m. deadline approaches. Even though I do have approval from the head of the department, I’m hoping I don’t suffer the same fate of Blago. I don’t look good in orange. Gallery | This entry was posted in Daily Life and tagged Barack Obama, coworkers, daily life, Government, humor, Illinois, life, people, Politics, Postaweek2013, work. Bookmark the permalink.